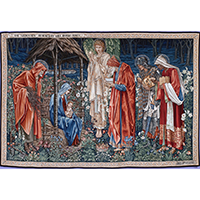 The Adoration of the Magi is a tapestry by the English artist Edward Burne-Jones and the inspiration for the fourth in our series of Christmas card by James Anthony. This traditional Christmas Card has the biblical passage on the inside cover, from Luke 2:11, of the angel of the lord speaking to Mary. "Today in the town of David a Savior has been born to you; he is Christ the Lord." The inside back cover has the following Christmas greeting "May this Christmas season bring you and your family the gifts of Peace, Joy, Love & Happiness all year long. Merry Christmas"
The Adoration of the Magi Christmas Card is a traditional Christmas card that reminds us what Christmas is about.